I began cooking because I love to eat. I was just a kid then watching Galloping Gourmet and yearning for coq au vin and homemade cake. I began really cooking in my 20s, to duplicate at home the dishes I read about or had eaten in restaurants in New York, Boston and Atlantic City. Yes, I got around back then. Now, not as much, so I’m back to cooking dishes I’ve read about. I have waited and waited for a local Chinese restaurant to start serving the caramel duck and chicken that’s been so popular lately, but I might as well be wishing for a unicorn. It ain’t gonna happen in Akron, Ohio. So I made it myself. My version is very different from the stir-fried dish born on the West Coast. It’s summer, so I fired up the grill and roast-smoked a whole spatchcocked chicken. Beforehand I dry-brined the bird with a mixture of salt and fresh ginger ground together in a food processor. 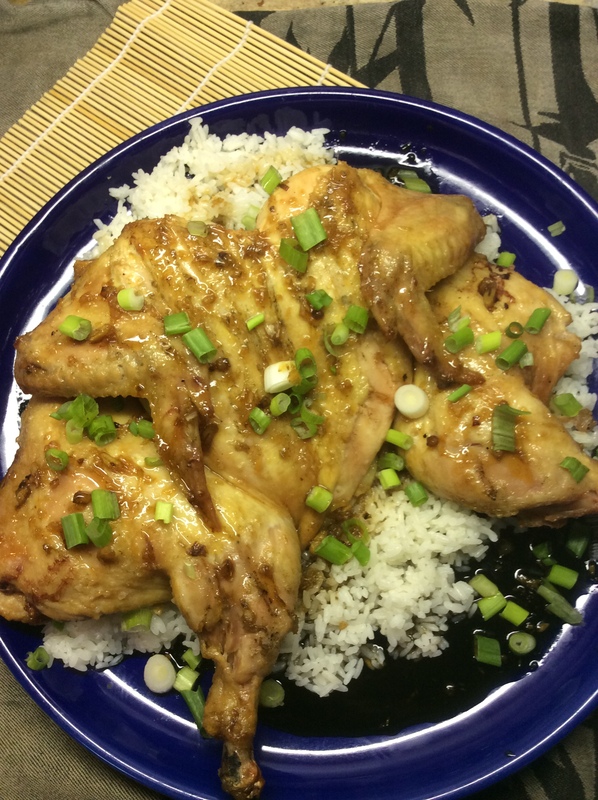 When the chicken was almost done, I made a caramel sauce spiked with orange juice and finished with more ginger. The base of the sauce is simply water and brown sugar, simmered until the sugar dissolves and the mixture thickens. The sauce is sweet and caramel-y, but not nearly as sweet as it sounds. Vinegar, ginger and orange juice, along with soy sauce and garlic, give the sauce dimension. This chicken dish is gorgeous enough to serve to company, but delicious enough to want to hog all to yourself. Remove and discard giblet package if included with chicken. With poultry shears or a sharp knife, cut chicken up the back, on both sides of the backbone. Discard backbone. Trim any excess skin and fat. Wash chicken and pat dry. Place skin side up on a baking sheet. Press down firmly to flatten the chicken. Place salt in a food processor. Drop the ginger in chunks through the feed tube while the motor is running. When the ginger is thoroughly chopped, rub the ginger-salt mixture all over the chicken. Cover and refrigerate at least 4 hours or overnight. About 1 1/2 hours before dinner, build a medium-large charcoal fire in one-half of a grill. Or heat a gas grill to medium. Brush most of the salt and ginger from the chicken. Lightly rub oil all over chicken. When the coals have completely ashed over, place chicken on grill grid on the side opposite the coals, skin side down and meatiest part of the breast toward the coals. Cover with the grill lid, leaving vents wide open. Cook for 1 to 1 1/2 hours or until an instant read thermometer inserted in the thickest portion of the thigh registers 160 degrees, turning chicken once during cooking. Remove chicken from grill, cover with foil and keep warm while making the sauce. Sauté garlic in oil in an 8-inch skillet until softened. Add ginger. Remove from heat and carefully add water and brown sugar. Return to heat and bring to a boil, stirring to dissolve sugar. Boil gently without stirring until mixture is a dark honey brown. Carefully add vinegar and stir to dissolve any crystals. Stir in orange juice and soy sauce. Boil until sauce thickens to a glaze. Pour over chicken on platter. Scatter scallions over sauce and chicken. Serve with rice. Makes 4 to 6 servings. This is the weekend I’m liquidating my cookbook collection and also selling a bunch of kitchen equipment, from juicers and a Spiraletti to a jerky gun and a table-top grill. Yes, this is a tawdry yard-sale ad, but I justify slipping it into my newsletter because there will be lots of stuff for foodies. Come browse or just chat from 9 a.m. to 4 p.m. Friday, Saturday and Sunday, July 6-7-8, at 4183 Copley Road in Copley. I made a mistake in my hummus recipe of three weeks ago. You will need to add some of the warm cooking liquid to the beans when you first begin to puree them, or the bits of beans will just hug the sides of the processor bowl instead of coming together in a fluffy puree. More cooking liquid is added at the end to achieve the proper consistency, as instructed in the recipe. Egg sandwich with pesto; hummus with crudités, grilled ribeye steaks, roast carrots with sea salt; spaghetti with meat sauce and walnuts; two hard-fried eggs with pesto on a slice of seeded whole-grain bread; grill-smoked ginger chicken with ginger caramel sauce, steamed rice; avocado toast. A California roll from Sushi Katsu in Akron; cavatelli with sauce Bolognese and a tossed salad at Scarsella’s Restaurant in Youngstown; corn on the cob and two barbecued (baked?) pork ribs at the Ribs, White and Blue Festival in downtown Akron; a habanero pork taco, Buffalo cauliflower taco and chips with homemade salsa and guacamole at a friend’s party, catered by the fabulous Funky Truckeria food truck. Tell us about Tony’s new outdoor oven. Is it a smoker/grill combo? How did City Barbecue’s pulled pork compare to my favorite, Old Carolina? I always had the opinion no one could top Old Carolina’s. You asked for lunch recommendations. One of my favorite lunch spots in Fairlawn is the Bombay Grill. They have a daily lunch buffet at a reasonable price but I like ordering off the men and always start with a bowl of their Indian-spiced tomato soup which is, by far, the best tomato soup I’ve ever had. Now I HAVE to have some of that tomato soup. I tried Bombay Grill when it first opened in its new location at 117 Merz Blvd., but it hadn’t gotten its act together yet. I will try it again on your recommendation. I thought City Barbecue’s pulled pork was better than any I’ve had anywhere at the restaurant’s VIP pre-opening party. A week later I visited the Fairlawn restaurant again and was disappointed. The pulled pork had lost that vinegar-swab juiciness. Still good, but maybe not quite up to Old Carolina standards. Our old, handmade outdoor oven is by far the best thing Tony has dragged home from an auction. It is an oblong box of welded steel plates, about 4 feet high and 2 feet wide, with a good-sized oven above a fire box that can hold charcoal or wood. Tony made a chimney for it. So far I’ve used it once to make a roast chicken. I’m going to add a pizza stone and make some flat breads next. Tony is a great scavenger, which is one reason we’re having the yard sale. Stop by and I’ll show you the oven.